COLEMAN & SUDY CLOSE DOWN ENLIGHTENMENT: Enlightenment XIII marked the end of the longest running BPA mini-con. 25 players made an appearance for at least one game of Age of Renaissance. The players are to be congratulated for their support of this fading favorite. Even in its final year in a terrible economy, they managed to draw the requisite minimum 25 players for a quality tournament. Rising costs and the lack of sufficient pre-registration commitment brought about the decision to pull the plug on this dedicated play weekend. Although we did manage sufficient participation to keep the conference going another year, it was decided that the event had been "on the bubble" too long and that it was better to go out on a good note rather than risk disappointing anyone by a subpar turnout. Terry Coleman, who ranked just 44th in AOR laurels going into the weekend, pulled off a big upset by winning his third straight game in Round 3—the latter two at the leader's table—to pull away from the field in what proved to be one of the most lop-sided victories in the history of this tournament. So great was his lead that the nearest challenger, defending champ Ken Gutermuth, opted out of Round 4 to play ManifestDestiny and abandoned the title to Terry. Enlightenment fans canrejoice that the format still lives on as a Pre-Con at WBC this summer. Meanwhile, Kevin Sudy won the Manifest Destiny tournament, coming on strong by winning his last two games to track down early leader Eric Wrobel, who had won his first two contests and finished third overall. Jeff Mullet won his first and last game, beating Eric and thereby overtaking him for second place. Game developer Ken Gutermuth—with a win and a tie—finished 4th, while Greg Stripes parlayed his first ever MFD win and a close second to finish 5th overall. Game designer/defending champ Bill Crenshaw narrowly grabbed the 6th-place plaque over Rob Kircher. Details on both tournaments are at http://www.boardgamers.org/specific/aor10.htm. DUNNING MOURNED: WBC lost another valued member of its extended family recently. Tom Dunning, a longtime GM and rail game aficionado, died of complications from esophageal cancer. 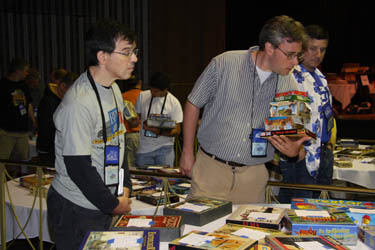 Tom was an exceptional Euro gamer and held a special place in his heart for all train games and auction style games. He loved competitive tournaments and yearly traveled to participate in Euroquest and the WBC along with playing in many of the BPA PBEM tournaments. At the time of his passing, Tom was ranked 17th among BPA's top competitors, having won ten tournaments. Tom has been memorialized on the Memorial page of our website and will be remembered this summer in a special tribute to recently departed members in the Lancaster Showroom. WBC EVENT PREVIEWS: WBC 2010 is now on line with a "host" of new features and attractions. In depth previews of each of the 2010 WBC tournaments—including a record nine Pre-Cons, many with new formats, are now on line as only WBC does them at http://www.boardgamers.org/yearbkex/. WBC AUCTION PRE-REGISTRATION NOW OPEN: BPA is now accepting pre-registration of lots for its annual WBC game auction in Lancaster, PA, on Tues., Aug. 3. Items must be delivered in person on Monday night or the following Tuesday morning before noon by registered members. Since the auction is very popular and lots are limited to 550, pre-registration of items for the auction is highly recommended. Our previous auctions have sold out via pre-registration so don't expect to bring items unregistered to the door. Check out the details at http://www.boardgamers.org/wbc/auction.htm. Download your Lot Forms now. Don't procrastinate! NEW this year: upon receipt of your submission, you will receive confirmation that your list was received. However, decisions on acceptance of lots will not be sent until July 1. All submissions should be sent to wbcauction@boardgamers.org. An updated list of items made available for sale will be posted in the weeks preceding the convention. AUCTION STORE PRE-REGISTRATION REQUIRED: Located in the same showroom with the Auction, buyers will be able to peruse items with a set price within view and earshot of the auction. The Auction Store allows us to increase the number of items handled in less time while offering sellers a more efficient way to offer lower priced items at a reduced commission. Items in the Auction Store have a top price of $30 AND MUST be pre-registered by July 26. Don't be turned away for failure to pre-register items as a few scofflaws were last year. Sellers are encouraged to read both the Auction and Auction Store details carefully to determine which venue is the best choice for their items. Remember: Unregistered items will not be accepted. After processing the submission, the Auction Store Administrator will provide Lot Numbers for the items. See http://www.boardgamers.org/wbc/auctionstore.htm for details and to download your Auction Store forms. You need not prepay any fees until you deliver your items to the Auction Store but the items MUST BE preregistered. Come prepared with your Auction Store Item forms already completed. NEW: Pre-registered Items with lot slips are to be delivered between 6 and 10 PM Monday. Auction Store items will NOT be accepted on Tues., Aug. 3.
to register. The Pre-Reg form should be of interest even to current members for its information on the popular WBC game duffel bags and souvenir t-shirts. Check our Prereg page for your current registration status or to advertise for or find rides, roommates, or open gaming opportunities. It will be updated weekly as information is received. If you'd like help with any of the above, just email your requests to conventiondirector@boardgamers.org to be listed on the page. All we ask is that you notify us to remove your listing once your need is fulfilled. WBC YEARBOOK: Our Annual mailing will occur soon and include a copy of the 2009/2010 Yearbook for qualifying members of record residing in the US (one per household). If you have moved during the past year, please advise us of any change of address immediately at conventiondirector@boardgamers.org. Yearbooks lost in the mail will not be replaced. A smaller program containing a detailed schedule will be available to all members at WBC registration and will also be posted online in June. For our friends residing outside the US and those who are just curious to see what they are missing, an on-line version of the yearbook is available. A limited number of 2009/2010 Yearbooks will be available for $10 each while supplies last. See the Pre-Reg form for ordering information. Late joining Tribune members may also pick up a free copy at registration while supplies last. WBC SOUVENIR DUFFEL BAGS & T-SHIRTS: Last year we ordered a few duffle bags with an embroidered BPA logo to pack and transport games for the BPA Game Library. They got so many admiring comments and inquiries, that we put them in the Auction just to gauge the interest and were astounded to see them sell for between $60 and $100. We have safely and comfortably transported as many as 15 typical boxed games in one of these bags. Your results will vary depending on boxsize, but it is safe to say that these bags can transport 10 AH-style bookcase boxes without using the end or side pouches which can be used for smaller games, clothes or toiletries. This year you get a bargain AND a chance to support your favorite gaming convention as we are selling them for just $40 in your choice of two attractive colors—red or hunter green—while the supply lasts. In addition, WBC again features the original high quality, silk-screened shirts featuring the BPA logo. If you'd like a souvenir shirt, you need to pre-order it for pickup at the show. This year's color is sand. See the Pre-Reg form or our Souvenir page for details on both items. JUNIORS: In keeping with the family-friendly atmosphere of Lancaster Host (which is adjacent to an amusement park), WBC again offers a full slate of Junior events. Registration is FREE for Juniors accompanied by	an	adult member of BPA and who participate only in Juniors events. Event winners receive a plaque. WBC SCHEDULING AIDS: Steve Okonski presents a host of convenient programming tools to help you plan your WBC week. Choose from among the Custom Scheduler, an All-in-One schedule, a spreadsheet schedule, or several downloadable pdf pocket schedules in color or black and white. All of these and other soon-to-be-posted aids can be found on our Schedule page. LANCASTER HOST SELLOUT: Many WBC regulars will be disappointed to discover that Lancaster Host is already sold out for Wednesday through Saturday of the upcoming WBC. While you can still reserve rooms at the Host for Pre-Cons, you will need to check out in mid-week. Not to worry—BPA also has group rates at the nearby Continental Inn across the street. The Continental offers bargain rates and free hot breakfasts when you ask for the World Boardgaming Championships group rate. However, do not delay. Our group rates and room block expires soon and when they're gone, they're gone. Lancaster area hotels often sellout during the tourist season. Reserve your room now. Get the details at http://www.boardgamers.org/hotellan.htm. WBC 2010 POSTER/FLYER: Help spread the word. Download the current WBC poster or flyer featuring the artwork of Kurt Miller from our Publicity page and post it at your next club meeting or ask your local gamestore to display it. CHARLES ROBERTS AWARDS: The annual Game Design awards announced and presented at WBC every year are now conducting their online voting through Sun., July 18. You are encouraged to support your favorites at http://charlesrobertsawards.com/voting.php. REVAMPED SAMPLER SHOWCASE: Thanks to the globe trotting efforts of Tom McCorry, the Sampler Showcase is back as an introduction (not a pre-con) of the new full week of WBC. Sampler Showcase is an Open Gaming festival free to all paid WBC attendees featuring scheduled hands-on sessions for learning new games under the direction of volunteer game mentors who will be on hand to teach 12 exciting new games. See the Sampler schedule. GETTYSBURG ENTERS QUARTER-FINALS: After three rounds, the elite eight moving on to Round 4 are Tom Gregorio, Ed Menzel, Dennis Nicholson, Dan Overland, Mike Pacheco, Greg Smith, Bill Thomson, and Jim Tracy. After the higher-seeded player won every game in Round 1, and five of 16 games in Round 2, the upsets took place in the top ranks this round, with seeds 1, 3, and 4 (your Gamemaster, Allen Kaplan, and Barry Shoults, respectively) all going down. One might put a slight asterisk on this trio of upsets, though, as the winners, Nicholson, Gregorio, and Overland, are longtime gamers, if new to Gettysburg ‘88. One thing is now guaranteed: a new PBeM Champion, as the winners of the two previous e-mail tourneys have both been eliminated. Fortune continues to favor the Rebels, with the South taking 18 contests to only eight for the Union. 22 of 26 games have featured a Confederate bid averaging 2.95, and four games had no bid. No one has been adventuresome enough to bid for the Union. NICHOLSON WINS MARCH MADNESS: Champion Dennis Nicholson’s 5th seeded 1998 North Carolina team reached the Sweet 16 with nine-point wins over Bob Jamelli’s St. Johns 1995, Thomas Browne’s Michigan 1976 and Tom Dunning’s Oklahoma 2002 squad. He then defeated Mark Yoshikawa’s Pittsburgh 2009, Terry Coleman’s Michigan 1989 and Harry Flawd’s Memphis 2006 teams to reach the championship where he bested Daniel Leader's 8th seeded Duke 2004 squad handily 96-75. Other laurelists included Harry Flawd, Mark Yoshikawa, Terry Coleman and Don Greenwood. More details and updated laurels are available at http://www.boardgamers.org/yearbook/mmspge.htm. Get a complete tour of the brackets at http://www.nktelco.net/bdmonnin/mm-brack-2010.htm. WASHINGTON'S WAR TO BEGIN: Keith Wixson always runs a great tournament, be it PBeM or live so it's always good news when he starts another one. The inaugural contest for the newly released Washington's War scheduled to start May 17th promises to be no different. Each swiss round will have a maximum duration of 10 weeks. A new round will begin a few days after the last game of the previous round has been completed. If a game is not completed in 10 weeks it will be adjudicated so players are advised to enter only if they can maintain the required rate of play. See http://mysite.verizon.net/vze4bc94/waw/index.html. SHIFTING SANDS: The 4th and last round of the Swiss play has begun. Most games went the distance to the last two turns, making for exciting close games. Still many games ended in an Allied victory, with the Allies holding a 9:4 superiority in wins this round. Out of 13 games we also had three successful Herkules Invasions of Malta and no Malta Victorious plays, but in all three cases of Malta falling the German still failed to win. Bidding for the allied side has continued to hover between 1 and 2 victory points with an average of 1.77. At this stage only three players have a record with two German victories, including Andy Friedmann who only has German victories. Following this 4th swiss round, the four-player single elimination playoffs begin. MANIFEST DESTINY: Enlightenment format still lives. The 2010-11 Manifest Destiny PBeM tournament will start June 1, 2010. The format has been changed to a four-round, Enlightenment style tournament, with pairings in later rounds based on players' finishes in the prior round. Please contact Bill Crenshaw at billcrenshaw@verizon.net no later than May 25, 2010, if you are interested in playing. See http://www.markneale.com/bpa/pbem/md/2010/. HOCHBOIM WINS AMUN RE: In a close, low scoring game, Haim Hochboim managed to keep just a few points ahead of everyone to grab the 2009 Amun-Re online tournament Wood! At the half way point everyone was within three points but Haim managed to have the top money going into the 2nd half. The provinces popped up in a non-optimal order, nullifying many of the scoring cards and resulting in a couple rounds of haves and have nots in the bidding. Bidding first in a round proved to be critical throughout with the money being tight for everyone. Still managing to score two power cards, Aran almost managed to pass Haim in final scoring, but fell short by just two points when Haim did get to score a bank of the nile card. For all the details see http://www.spielbyweb.com/game.php?games_id=79240. Also earning laurels were Aran Warszawski, Curt Collins II, Kevin Wojtaszczyk, Chris Trimmer and Grant Ladue. Complete details and updated laurel totals are available at http://www.boardgamers.org/yearbook/amrpge.htm#pbem. All BPA PBeM tournaments require current BPA membership when the event starts. All multi-day paid attendees to WBC are current BPA members for the balance of that calendar year. Associate Calendar year memberships enabling play in all PBeM events starting in that yearcost only $10 and earn discounts for pre-registered admission to all BPA gaming conferences. You need not keep your membership current in order to finish a PBeM event. Players may join the BPA throughout the year. Members are reminded they can upgrade their current memberships at any time by remitting the additional funds. See http://www.boardgamers.org/bpaterms.htm for details. Last updated 5/13/10 by kae.